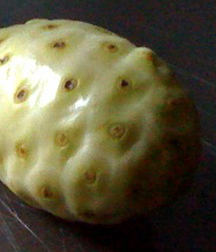 Morinda citrifolia is the scientific name for noni. 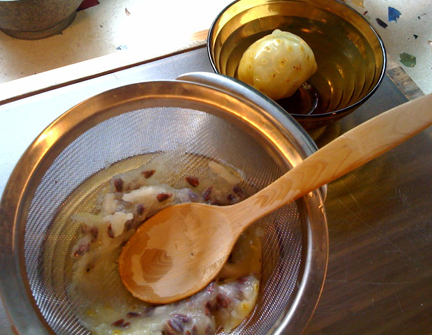 I’m interested in Hawaiian laau lapaau (healing medicine). I’m remembering this as I work/play at regaining my health. A few years back when stocking Hale Kuai Cooperative, a store with Native Hawaiian products, we made sure we had a full line of Hawaiian herbal medicine on our shelves. We did this, knowing that the kahuna lapaau (master practitioners of Hawaiian healing) did not always agree on how to use certain plants. Noni is one of those plants. I heard differing opinions on whether to use it externally and/or internally. I heard and read claims that noni will cure whatever ails you. That the large dark green leaves could heal broken bones. That one could rid head lice by smashing the ripe fruit on the scalp. 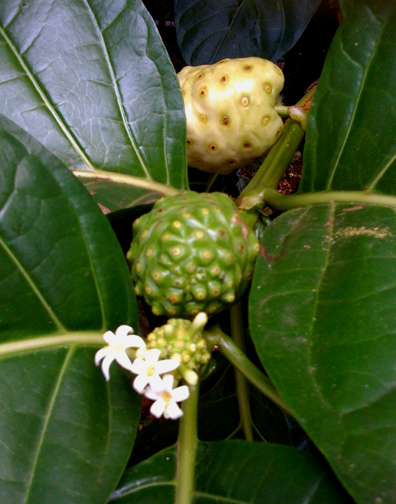 Noni (Morinda citrifolia) in three stages, bottom to top: flowering, green, almost ripe. Try the tiny white flowers for breakfast or as a garnish on salads. There is very much to learn about noni. The literature is extensive, and the information is very interesting. I list some resources for lay readers at the end of this post. Today I just want to explain what I do with noni now, following a suggestion by the medical intuitive Camille Copeland who lives on Kauai. For a time I gathered my own noni juice the traditional Hawaiian way by setting the ripe fruit in a clean and covered glass jar in the sun for a period of time until a dark liquid was extracted; then drank it as a morning tonic. This didn’t last long with me. Listening to Camille on the radio one Sunday, she advised a caller to take noni fresh, not fermented, as a guard against inflammation. Did she have a tree? I thought, hey, I have a tree. I’ll give it a try. 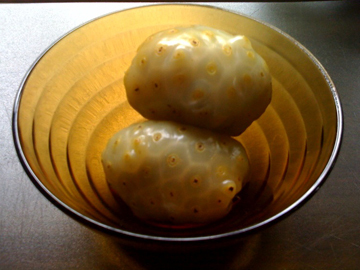 Every day I check my noni tree for a fruit that is opaque with white skin. If there is one that is nearly white, like pale yellow, that’s okay too, I can pick it. Like a tomato, it will continue to ripen after picked. I put the noni in a glass bowl. After one or two days it turns translucent. Then it’s time to press it through a sieve. The fresh foamy noni pulp tastes slightly tangy. It doesn’t have an objectionable aroma to me. (The smell is likened to strong cheese.) I eat about a heaping tablespoon in the morning on an empty stomach, about 10-15 minutes before breakfast. I store any surplus in a tightly lidded jar, properly labeled, in the refrigerator. I think this is working for me. I thank my noni tree each time it gifts me with its wondrous fruit. Our Hawaiian co-op carried David Marcus’s Hawaiian Herbal Blessings of Maui. David has supplied noni products for many years, including to Hale Kuai Cooperative. Noni: Aspirin of the Ancients by Diana Fairechild is a wonderful testimony about the wonders of this plant. Check amazon.com for the small paperback. Aloha. I’ve updated my original post to say, refrigerate the surplus noni pulp, and to list Diana Fairechild’s book correctly as “Noni: Aspirin of the Ancients.” Small details, but important!